The news network harps on murder simulators like it's 1999. Now that gaming has seeped into the masses by way of smartphones and Angry Birds, you'd think that the moral panic over video games has subsided. While that might be true, it's not going to stop people from trying to exploit remaining pockets of susceptibility anyways. Today's example comes courtesy of Fox News, who's started a two-part feature entitled "'Training simulation:' Mass killers often share obsession with violent video games". If the headline didn't give it away, the article isn't exactly in favor of violence in gaming. Various people with fancy titles mention various headline mass murders with tenuous connections to popular games at the time. 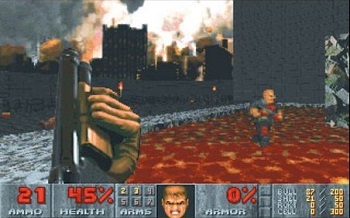 Doom, Mortal Kombat, and Grand Theft Auto all get time in the moral panic spotlight. Important factors like availability of guns and mental illness are forgotten in favor of lines like: "Three more recent killers... all were active video game players." However, the article does end with Dr. Doug Gentile, who's quoted as being rather reasonable. "I think it's the wrong question -- whether there is a link between mass shootings and violent video game play... I understand people want to look for a culprit, but the truth of the matter is that there is never one cause." Clearly, Dr. Gentile isn't thinking about the children! The second installment is supposed to explore the "ultrarealism" in modern games.